Kytola Model VL variable area flow meters are available in a range of materials, designed for durability and reliability in industrial environments. Common uses include monitoring lubrication oil, flush water applications, gas flow measurement, and sealing and cooling water measurement. 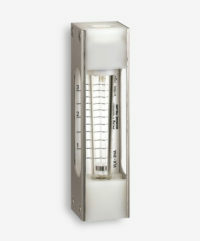 Model VL meters have the option to be configured with low/high flow alarms, constant flow regulators and alternative materials for specific applications. For similar products with flow adjustment valves, please see the Model VD and Model VE meters.